At True North Gold Buyer Ltd., the gold, silver & platinum buyer of your choice, we offer you top prices for your old or unwanted coins. Below you will find further information on Canadian Commemorative Gold Coins we buy. If you cannot find your coin below or have a coin that you cannot identify please write us an email via our Contact Form or call us at (705) 302 1055 to obtain an estimate. Please keep in mind that we may not be able to provide you with an accurate estimate until we have seen the coin. We will gladly buy any other gold coin or precious metal bullion you may wish to sell. These beautiful commemorative 100$ gold coins have first been issued in 1976. The obverse features Queen Elizabeth II and the reverse has a different design every year. Unfortunately over the years their gold content has been changed a few times. Below you will find two tables. The first one is a short summary of the different gold contents sorted after the date the coins were struck. If you are not sure if your coin is a 22K or a 14K coin please have a look at the second table. We have collected and provide you with information about every 100$ Commemorative Gold Coin that exists and that we buy. The 14KT coins issued since 2004 have a lower weight and do therefore contain less gold than the older one. 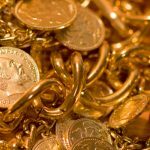 Most of our competitors will pay the same amount of money for old ones even though they contain more gold. This Gold Coin has been issued in 1967 to commemorate the 100th Anniversary of Canada. It is composed of 90% gold and 10% copper which means that it has a fineness of .900. Since the coin weighs 18.2733 grams that means it has an actual gold content of about 16.44597 grams.